Day 10 kicked off with another long drive through mist and rain to return to where we’d left off the day before at Portscatho. This was to be the last day that we had Tom’s brother Mike with us so we made the most of his mule services while we could. 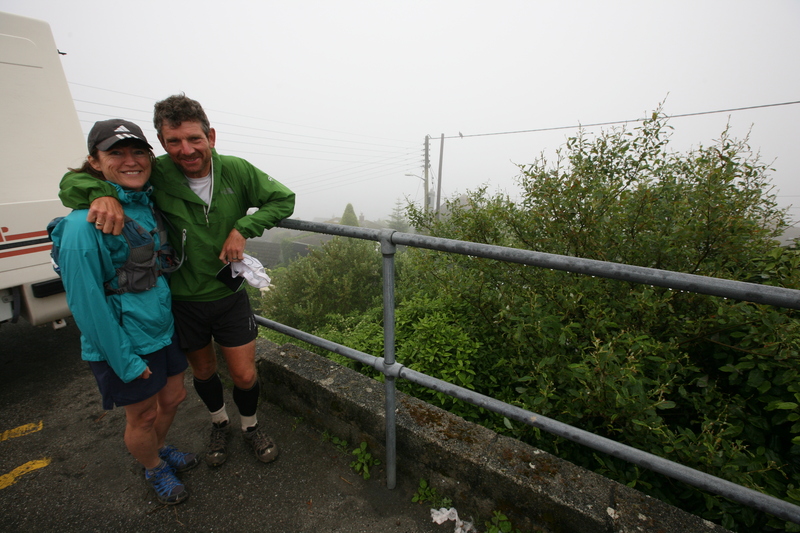 The three of us set off into a grim morning, the cloud hanging oppresively just above sea level. The trail was, for once, relatively gentle and although we were getting soaked in all the long, rain-sodden grass our progress was good, at least by recent standards. We climbed up and around Nare Head through a still and silent world, with visibility down to as little as 10m. 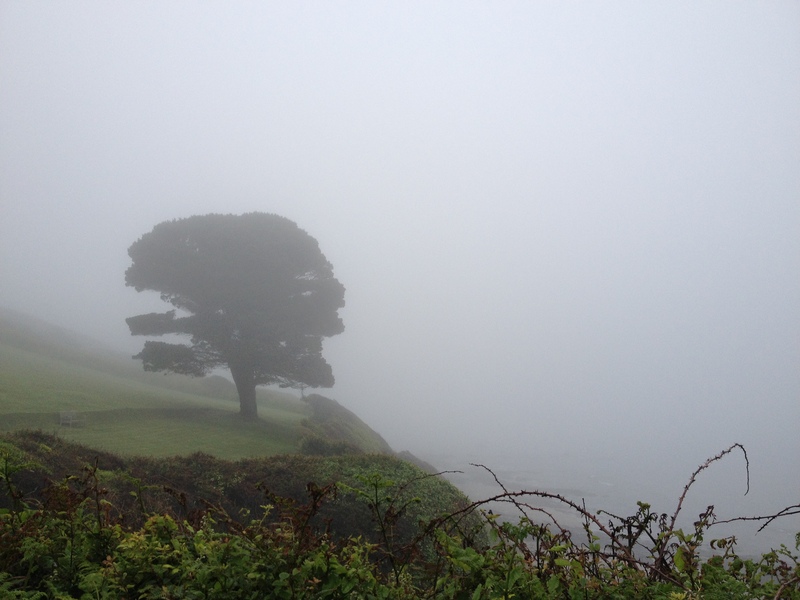 Mist, mist, mist…. and oh, a tree! There followed a long section along the cliff-tops that is rumoured to be a very beautiful part of the Path, but we were none the wiser given all we could see was the inside of a cloud. We’d been discussing the need to speed up our support stops and we put this into practice at Portloe, some 14kms into the day, quickly grabbing some food before climbing back out of the village. Things seemed to be going well and our morale was higher than it had been for some days. But all that was short-lived. Tom’s main pain had shifted to his shins and was steadily building. My left shin was coming out in sympathy and was also joined by regular hot shots of pain from my right achilles and some horrible sciatic twinges that emanated from my left hip. Little by little the pace slowed, the groaning became more voluble and our mood darkened to match the weather. The stop at Caerhays Castle was not fast. We both needed ice treatment for our shins and a cup of warm, sweet tea to warm us up. Ahead there was another big climb around Dodman Point and now my sciatic pain was really making life miserable. We staggered into Gorran Haven where I asked Phil to find a small rubber ball that I could sit on. This may sound strange but I knew from previous experience that it might just help release the trigger point in my bum that was the source of this pain. I made a sorry sight sprawled on a wet pavement in the rain wriggling around on a small ball! However, it did seem to offer some relief and for the next hour or two I ran more easily. The Path was now a roller coaster ride along the coast that threw lots of short, sharp hills at us, while long sections of overgrown trail further slowed our progress. We were both hurting big time but we’d now resigned ourselves to the fact that we were on a survival mission. The goalposts had moved. We’d both well and truly let go the idea of finishing within two weeks and had instead calculated that a steady 65 kms a day, done at whatever pace we could manage, would still get us through in 17 days. With this change of focus we found ourselves in a much brighter mental place. In fact I fondly recall that long afternoon as being one of the best that we shared in terms of camaraderie. Adversity seemed to be bringing us closer together and our respect for one another’s qualities grew some more. 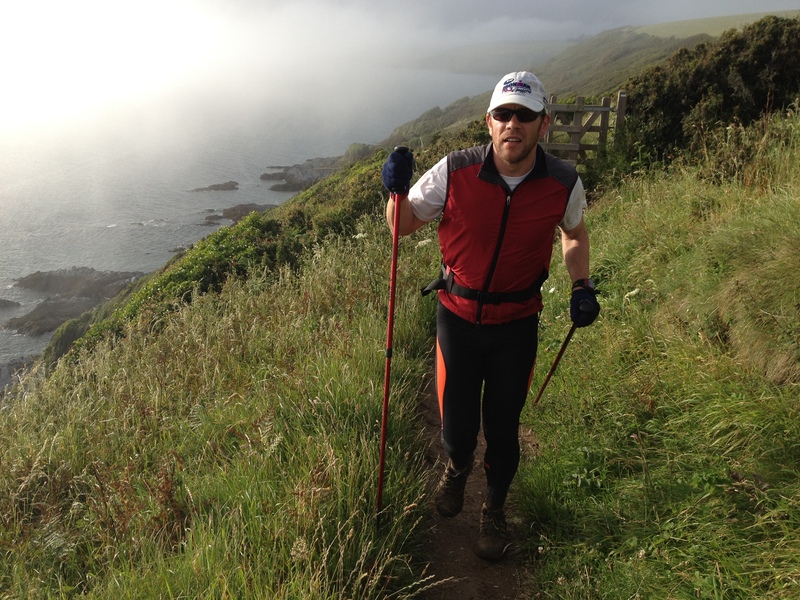 Heading for Fowey – Tom the pole master! As we rounded another promontory Tom pointed out a ghostly column on a headland way off in the distance across St. Austell Bay. It was the day marker, a navigational aid to ships, which was no more than an hour from our end-of-day destination, Fowey. It was 20 kms away, but looked much further in the mist. Nevertheless it provided a great target to focus on as little by little we drew closer and closer. I started to use an old visualisation ploy that I’ve used before in races, imagining a bungy cord attached at one end to the top of this marker with the other end attached to my chest. I could feel it pulling me towards it and with each step my resolve to see this through grew. Briefly the cloud lifted and we enjoyed an hour of evening sunshine, but as we approached the day marker the shroud fell back over the land. Rounding this point we had just 5kms left to go to Fowey. I couldn’t get to it soon enough because I knew that waiting there, fresh off the plane from Auckland, would be my wife Sally and son Beinn. This thought had sustained me all day long and I think Tom was probably getting sick of me telling him how much I was looking forward to seeing them. Those last 5kms seemed to take forever, not helped by the fact that we were both in too much pain to do little more than walk. But at around 8.30pm, after another 12 hours on our feet, we were there. The hugs were worth the wait. I hit the sack that night feeling a little more optimistic about our chances. But in the morning there was a bombshell waiting. Tom’s shins, both badly swollen the night before, had now grown some alarming lumps too. He was distraught but felt he had no option but to seek medical advice on whether or not he could continue. He was adamant that I continue on alone but hoped he’d be able to rejoin me before too long then come back to fill in whatever sections of the Path he missed out. It was a big call but at the time it seemed like the right one. With the added benefit of hindsight it was definitely the right one. Very tough, but right. I was gutted but felt more determined than ever to see this through. Part of me was now running for Tom too. The Path continued on the other side of the River Fowey at Polruan, which is reached by passenger ferry. But on arriving at the jetty we found it didn’t start up until mid-morning! This meant using the vehicle ferry and a bit of a drive. I was frustrated and bad tempered; I just wanted to get moving. But the good news was that Sal had decided to keep me company as far as Polperro, some 12kms along the coast. The climb out of Polruan was steep but once over the first hill it flattened out a little. I was delighted to find that my legs were feeling okay and the pains of yesterday had subsided. For the first time in days I was able to run at exactly my own pace, not struggling to keep up with anyone or having to hold back for anyone. As we trotted along I told Sal the story of the run so far and how gutted I was for Tom. It was great to have her at my side and the way forward started to seem so very possible. However, I should have learned by this stage that every emotional up is followed by an emotional down. And the next one wasn’t far away. We got to Polperro in good time but then spent 20 minutes or so searching for the support crew, but to no avail. Cold and bedraggled (did I mention it was raining!) there was little choice but to carry on and try to get in touch with them by phone as we went. Sal, less than 24 hours after flying from the other side of the world, said she’d keep going with me, which was a massive bonus. She tried to keep me rational while I, in my tired and irrational state, fretted about where the support crew were and whether they’d been involved in an accident. It was an enormous relief when a little while later a text came through to say they’d been held up in traffic and would now meet us at Looe. Looe was 20kms into the day and still Sal hadn’t had enough. Well, maybe she had, but bless her heart she decided to keep me company for another 12 hilly kms. It was on this section that both my shin and sciatic pain started firing up again, getting steadily worse as I tired. Things were starting to feel grim again and didn’t improve when at Downderry we met up with a very dejected Tom and found out he was unlikely to be rejoining us on the Path. I was now having to dig really deep. The cumulative exhaustion of 11 days and some 620kms on the Path was taking its toll on my mental state as well as my physical wellbeing. I was feeling more and more desperate and for the first time a genuine doubt about whether I could finish this seeped into my mind. I tried to fight it but didn’t seem to have the reserves of emotional energy that it required. My stores of positivity were running low. And I was alone on the trail. Just when I was least able to handle it I took a wrong turn, losing 20 mins and adding an extra 100m of descent and climb. Then the Path started a series of seemingly pointless drops from the road down towards the shore and back again. The sciatic and shin pain were becoming excruciating and the day’s end, let alone the Path’s end, was feeling impossibly far away. On a cold, windswept headland I met up with the support crew again. Beinn gave me a big hug, looking genuinely concerned for his daft old man’s predicament, and a little bit of fight returned. But I had resigned myself to walking for the rest of the day as this seemed to be the only way of keeping the pain levels manageable. The joy that I often feel when alone on a trail was now replaced by loneliness and self-pity. I was dreading this next section. So I was extremely grateful when Phil, who had been doing such an awesome job of looking after me from the start, now pulled on his trail shoes, loaded up a backpack with food and fluids, and joined me. We needed to get to Cremyll, from where the ferry to Plymouth departs, but I’d asked the crew to meet us 5kms short of there at Kingsand, thinking that was about as far as I could make it. 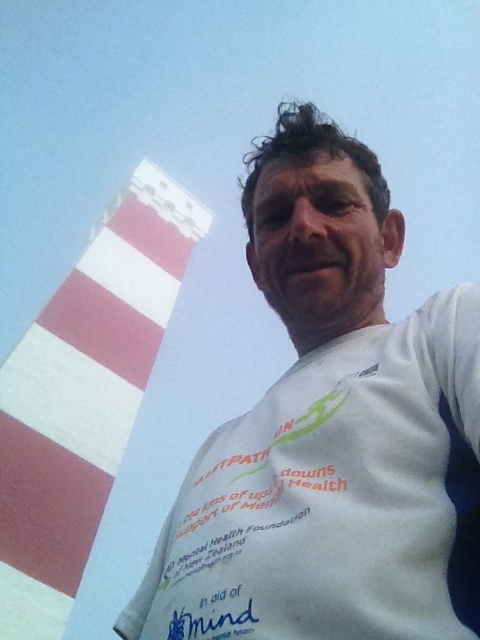 It was a slow plod around Rame Head and Penlee Point but little by little I got my sense of perspective back, helped no doubt by the quiet support of Phil. By the time we got to Kingsand I’d resolved to push on for the extra hour or so that was needed to reach Cremyll, although my resolve faltered slightly when we found the rest of the support team enjoying a well-deserved ale in the village pub. Fighting back the urge to settle in for the evening, Phil & I both downed a swift half for the road and suitably fortified, continued on. It took over 12 hours to cover the 58kms and 2,500m of ascent that this day had thrown at me, but nevertheless it felt like a major victory to have made it this far, knowing that the next day could begin in the city of Plymouth itself. However we were far from done. Ahead we had what should have been an hour’s drive to reach Salcombe YHA. That would have been long enough at the end of such a tough day but as we drove into the night the cloud descended, the heavens opened, and the road became narrower and more and more twisty. We were down to a crawl with Sal just about falling asleep at the wheel and I had to take over the driving for the last 15 minutes or so. How we ever got there in one piece I’m not quite sure, all I know is that it was very late when we did. By the time we’d had a hastily prepared dinner and got into our beds it was well past midnight and the alarm was set once again for 6am. 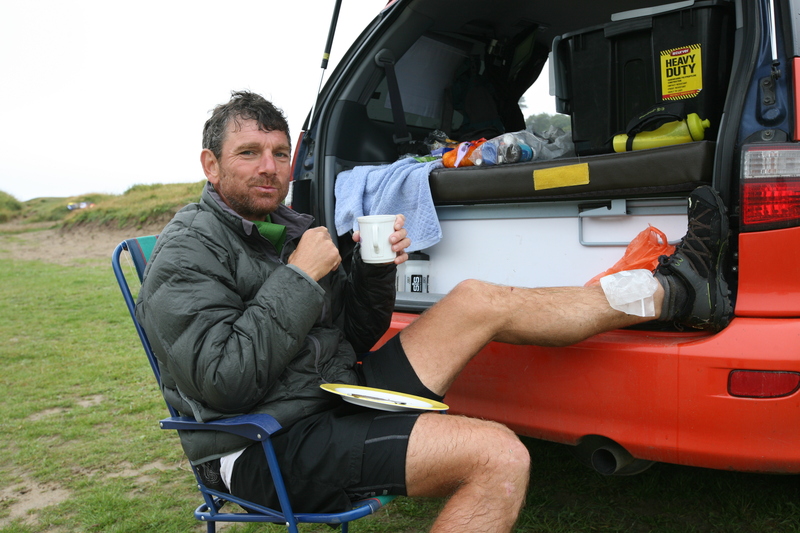 Such are the joys of long distance adventure running! Massive thanks to Spaceships UK, Inov-8 New Zealand, YHA England & Wales, Bodyneed Ponsonby and Telecom NZ for their wonderful support. I ran the South West Coast Path to raise funds for Mental Health Foundation NZ. If you are inspired by the story, please consider a donation to the cause – just click here to do so. 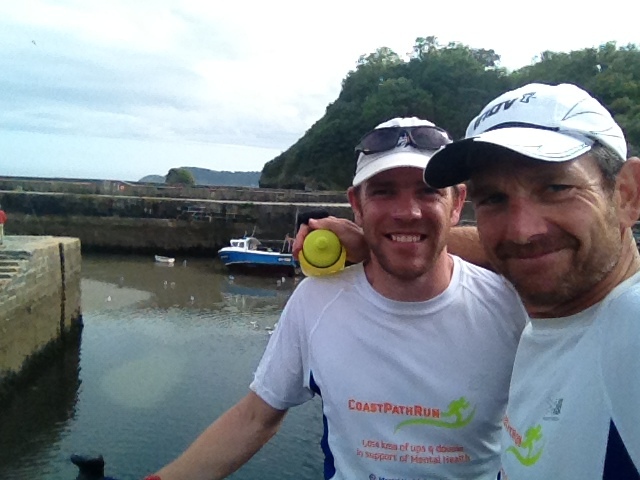 This entry was posted in Coast Path Run and tagged mental health, south west coast path, trail running, ultra running. Bookmark the permalink. Thanks Hamish. Pleased you’re enjoying the experience vicariously – a good way to do it!